"For the Lord himself shall descend from heaven with a shout, with the voice of the archangel and with the trump of God, and the dead in Christ shall rise first“. 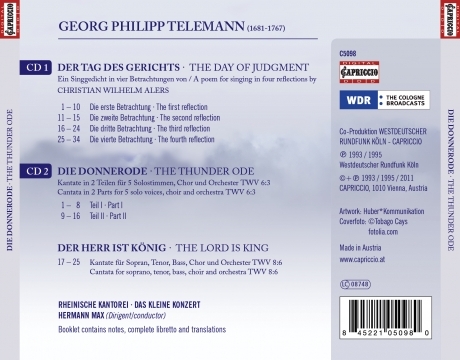 In addition Telemann lets the thunder, the wrath of God, rumble darkly and menacingly. The Lord, the Judge, approaches. The Day of Judgment begins. With these signals a gripping musical event starts that opens a rich, symbol-laden world of the most beautiful, inspiring, often individual artistic accomplishments of word and music to anyone who is prepared to come to terms with it. 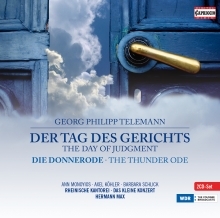 The group begun in 1755 of Telemann works of his old age includes, several sacred oratorios in an absolutely logical sequence – Der Tod Jesu, Die Auferstehung, Die Auferstehung und Himmelfahrt Jesu, Der Tag des Gerichts - as well as the two-part Donner-Ode, a cantata on Psalm models on the occasion of the Lisbon earthquake. . In all these late works, always wrestling with a compositional design suitable to the subject and the text, Telemann in each case strikes a specific note inherent in the work; he employs his compositional means in a way that develops an unmistakably individual character for the work. In The Day of Judgment Telemann is also the master of colour, of superior use of instruments. Thus it becomes clear that The Day of Judgment is not, for instance, only a monument in the history of the German oratorio, but introduces the theological discussions and eschatological thought of that time.